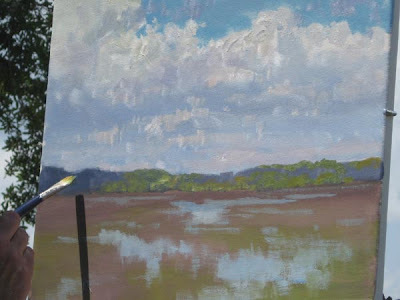 This demo was completed on Thursday during my week long workshop in Hilton Head. I would like to thank Barbara and Judy for sharing their pictures for use in this article. For this scene I chose a 16×20 canvas. I painted in full sunlight because the filtered shade under the trees kept changing causing me to constantly shift my easel. 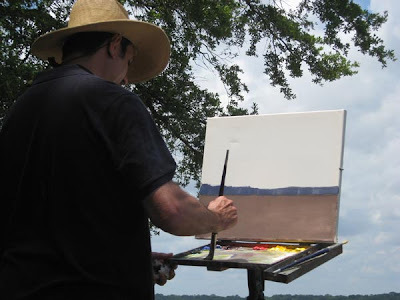 I start with a simple line to establish the shadow color of the trees on the opposite shore of the marsh. 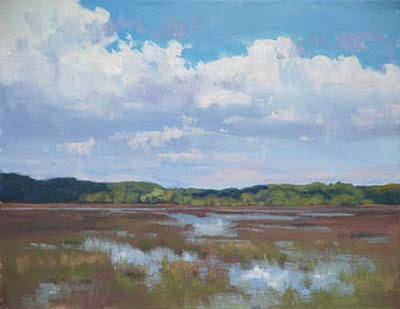 Once this color is laid down I go ahead and put in the general tone and color of the marsh. I design some color patterns in the marsh grasses with a green that is the same value as my initial marsh color. Once that is done I start on the sky. I block in the sky color and the shadow tone of the clouds. The clouds are moving and changing constantly so I don’t try to copy their forms, instead I use what I see to design them in the painting. 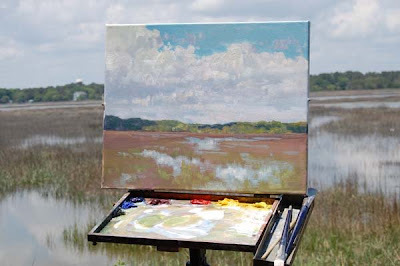 While working on the clouds I see the incoming tide is changing my fore ground so I switch to the marsh and design the water patterns in the marsh starting with the sky color. The trees have beautiful patterns of light and shadow as the clouds pass overhead and I design these shadow areas in my painting. The complete time for the painting from start to finish was one hour. 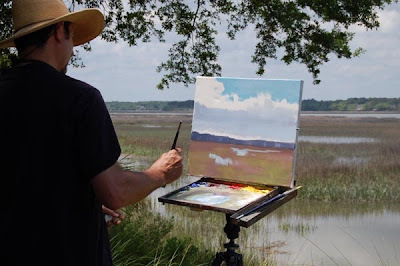 During my workshops I demo every day, I always limit my demo time to maximize students painting time in class; usually spending no more than an hour and a half on a workshop demo. Wonderful post Armand. I get so much out of demos like this. Great painting also. Everything in the clouds is a little off white. 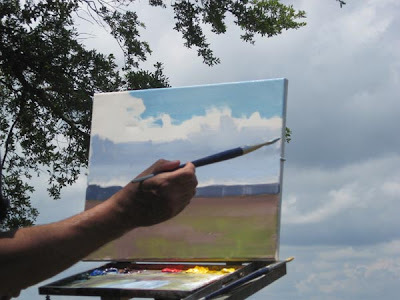 In the top of the painting, the cloud highlights have a little yellow in them and at the bottom a little red. Even though the trees have warm colors in them you will see they are cooler than the foreground greens in the marsh grass by comparison. I agree with Marco. The sky has great depth and demensionality. From that intense blue at the top to the lighter distant sky at the horizon. Amazing!